The Redbox Mini line of products currently consists of three Mini PC models, all offering cutting-edge performance and outstanding design, but differing slightly in their price and ability to handle particular tasks. All three models are based on powerful quad-core ARM processors and the blazing-fast Mali graphics engine supporting smooth playback of modern 4K videos and high frame rate in the latest Android games. Boasting rich connectivity, these Mini PC’s can be easily connected to routers and local networks by cable or wirelessly, at speeds reaching as high as 300 Mbit/second. 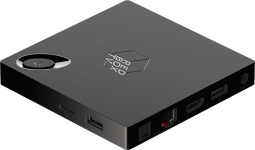 All Redbox Mini products are multifunctional devices supporting the installation of any applications from Google Play or, in case of Linux-based editions, any custom software packages tailored for particular usage scenarios.